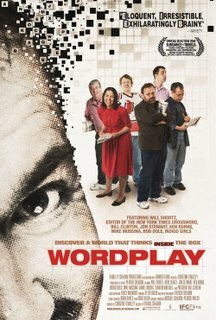 Tonight my wife and I saw Wordplay, a documentary about crossword puzzles, focusing on Will Shortz, editor of the New York Times' crossword and NPR's puzzle master. It was about an hour and a half long, and describes puzzle creators who submit their puzzles to Will. He could create the puzzles in each day's New York Times, but enjoys receiving a diversity of contributions which he selects and edits, for example to conform to the paper's style and difficulty by day (a "Monday" puzzle is the easiest and each day thereafter gets more difficult, I believe). He also creates, as I recall, about half of the crosswords published. The film has discussions with a number of celebrities about their interest, skill, and habit of doing crosswords. President Bill Clinton, television humorist Jon Stewart, master documentary filmmaker Ken Burns, baseball player Mike Mussina, retired Senator and presidential candidate Bob Dole, and singers Indigo Girls all appear in interesting discussions several times in the film. The hilight of the film is the annual March Crossword Tournament held in Stamford, Connecticut, where a few hundreds compete every year. Several are interviewed, and we witness the weekend long results as they unfold. It's amazing to see how fast these experts are at solving the puzzles, and finding some words I have not heard of! I have never been good at crosswords, though I think I am reasonably literate and at problem solving. Visiting online crosswords at USA Today (which gives immediate feedback when an incorrect letter is typed) and thinks.com tonight after the film confirmed my poor skills. I also found an amateurish crossword maker. The film was well made and fun to watch. In addition to reading about the film on imdb, one can also visit the official film website.